Some locations you find may be better shot at different times of the year as the sun will arc. I find that pretty much on Christmas day the sun rise at it furthest point to the right. Great for sunrise shooting at locations where cliffs cast shadows on the sand, but that is also very helpful on sunset too as locations where the sun is falling or if you’re having to shoot into the sun’s direction a different time of year can yield a very different result. To check the angle of the sun, along with sunrise and sunset times I can’t promote the Phone App called The Photographer’s Ephemeris, it is also available for your desktop computer as well (Free), but having it on you all the time is essential. Ok so let’s get into showing you some of these places. Location: Lower Fort Street, Sydney. The top of the street. How to get here: Easy walk from Circular Quay. Limited pay and display parking in the area, especially on weekends from the weddings. Buses. Whats worth shooting nearby: Head back and shoot amount the fig trees, you can grab some great angles of the bridge framing. This is a perfect example of a shot with the fig tree. Shooting Tips: Great location for your wide angle lenses 10 – 22mm lenses, 17-40 or 16-35mm. ND grad filters will help control the sky as you expose for the foreground to get detail in the shadows. This shot was taken about 15 minutes after sunset and was a long exposure of about 40 seconds. It’s about timing and getting lucky with the traffic movement. Just keep an eye on your shutter speed as the light will be dropping fast and to keep your shutter speed around 40 sec you might need to increase your cameras ISO to compensate for the darkenss that’s quickly approaching. A very easy to get to location at Milsons Point where it’s right along the harbour so there is no chance of anyone getting in your way. This shot is taken a little further up and standing on one of the sandstone rock ledges that protrude out. For an angle like this you are going to need a lens that goes to around 16 – 20 mm and this shot is a stitch, but the final result is impressive. Ok for those who have some spare cash and want to impress your loved one, while secretly getting to photograph one of the best views in Sydney then this is for you. Shooting through the window of the Shangri’s premium rooms with an amazing view over Sydney icons is hard to describe and beat, best of all it’s great on sunrise as well. Just make sure you shoot earlier in the year as the sun can rise directly in view of your window that can be a pain. But it would work well if your blending your digital images. How to get here: Bus Service, Ferry, Walking distance from Circular Quay. For $50 you can park your car in the hotel. If your paying around $800 for a room, whats another $50 right. Lol. Whats worth shooting nearby: Heaps. Your right in the city. But your not going to want to shoot anyway other than through the window in your room. Shooting Tips: Watch the reflection from the window in your room, put your lens as close to the window as possible and then drape a cloth over your lens. Put the camera in live view and make sure you can see any reflection or the cloth your draping over. A tripod is a must for light shots and also for bracketing images if you have challenging light. Map location to Shangri-La Hotel. Maroubra baths has great rock colour and the angle of the baths allows the light on the area fall evenly and regardless of the clouds you will walk away with a nice shot. You can even head down to the baths and explore the many angles down there as well. Whats worth shooting nearby: With shoot coastal locations your best to keep it local. 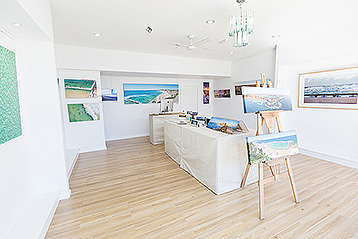 If you want to move somewhere then head to Maroubra Beach. I grabbed this shot one evening after the sun dropped. Shooting Tips: Sunset shooting out to sea is probably as easy as it is going to get as the light is very even as the light source is behind you. But it is still a time when you can use graduated filters and blending. If you snag the right clouds and light this is an angle that can really deliver. Even without clouds if you shoot at the right time of the year the afternoon light will coat the headland and the buildings. It’s an impressive photo that has eluded me all these years, even though I have seen some other photographers really nail it. Location:North End of Manly Beach, North Steyne. How to get here: Bus Service, Driving, Pay and Display Parking along Beach front and side streets. Shooting Tips: Nothing to challenging here the angle like this is taken when standing on the beach. There is a raised platform to the left of my shot that’s good if you dont like your angle. Map location to Queenscliff Beach. 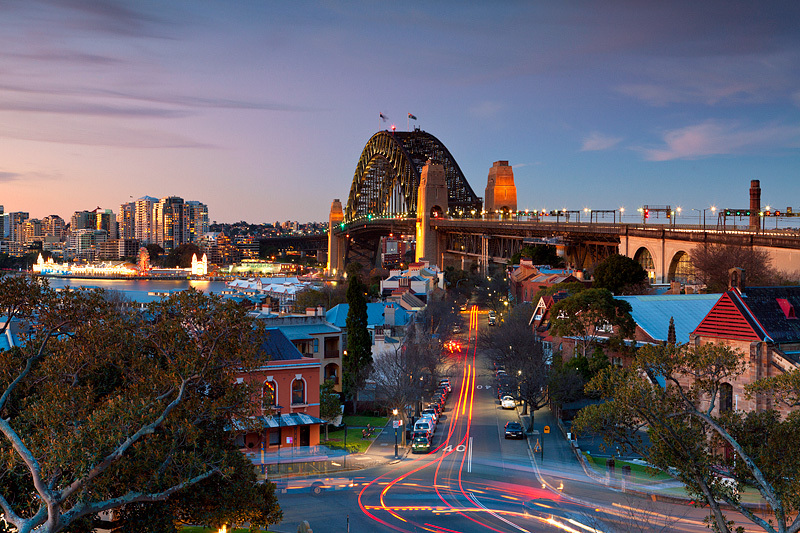 Location: The best location to shoot the bridge is from Glebe Point. The closest street is Glebe Point Road, or other roads leading there are Leichhardt St and Oxley Street. How to get here: Bus Service and Driving. Whats worth shooting nearby: If you walk around a bit you will find different angles. The water front is park land so it’s easy to find your own spot. Some good angles right down near the Sydney University Yacht Club on Ferry Road. Shooting Tips: Again your shooting with the light falling on the scene so it isnt going to be took challenging. Great spot for a wide angle digital panoramic stitch if thats your thing (it is mine) or a single wide angle shot. Location: Darling Harbour. All road lead to rome. Very easy to find. How to get here: Everything except via plane. Bus Service, Driving, Pay and Display Parking. Walking to this location is easy from the city. Whats worth shooting nearby:It’s Darling Harbour. 🙂 Walking around with your camera and you will find different things to shoot and angles. Getting to an elevated vantage point like I did will remove the busyness of the foreground in your shot. This image is shot from a nearby hotel looking into the city. With the new developments in the area you might be hard finding an angle without a crain on top of the building. Kind of like the Surfers Paradise on the Gold Coast. Shooting Tips:Shoot into the city and you will have the best light. The best shots I find are the ones after the sun has dropped. With all the windows the setting sun makes a mess of things, but once that goes you have some really nice warm lingering light and then as with my shot you get the nice pink hues. Would be even better with some cloud. In all fairness with this shot, don’t just jump in your car and rush to Turimetta Beach (no offense). I just wanted to show that on sunset keep your eyes on the cloud formations out to see as what happens when the sunsets and you think it’s all over can be quite the opposite. Location: This can happen anywhere along the coastline. How to get here: Your closest beach. Just pull on over. Whats worth shooting nearby:Depends where you are. If there is one thing I have learnt from doing this landscape gig for over 10 years. Your best shooting one location properly than several poorly. Shooting Tips:As I have mentioned before sunset shooting out to see is as easy as it gets, but think outside of the square. Think about your shutter speed creating silky movement in the water. Shutter speeds around 1 sec will give you a great effect. The movement will also be relevant to how fast the water is moving as well. But play around. Put your camera on Manual and have some fun. Location: Circular Quay, Sydney. – This angle is from the top level of the overseas terminal that is open to the public. How to get here: Bus Service, Driving, Pay and Display Parking. Walking to this location is easy from the city inner circle. Whats worth shooting nearby:Plenty you got the Harbour Bridge, shooting from the above Cahill Express Way. Shooting Tips: Single shot zoomed in on the sails is fantastic. You will need a zoom lens anything over 200mm will get you these from this spot. This photo is a panoramic stitch taken on a canon 70-200mm lens. Now I will admit my photo is not the best, but it is still a nice example of the angle you can get when shooting the Sydney Harbour Bridge over the Opera Bar in the evening light when they turn the lights on under their umbrellas. See thinking outside the square on shots. Whats worth shooting nearby:Heaps your right next to the Sydney Opera House. 10 best Sydney photography locations to shoot sunset that are easy to get too. This entry was posted in Photo Guides and tagged 12 best sydney sunset spots, best places to shoot in sydney, best sydney sunset locations, sydney photography locations, sydneys best photo locations. Bookmark the permalink.